The Saturday Decoy Open on the Yew Pool produced some huge weights. Leading the way with 172lb 11oz was Whittlesey rod Simon Godfrey, then it was Steve Pell on 167lb 14oz, followed by Richard Chamberlin on 150lb. Sunday’s Decoy Open was fished on the Beastie Lake and out in front was the in-form Tony Dawson with 131lb 5oz from peg 21. Then came Rob Goodson on 130lb 14oz followed by Des Proud with 130lb 1oz. In round one of the Decoy Over 55s Summer League on the Beastie Lake it was Jay Richardson who won from fancied peg 22 with 89lb 13oz. Will Hadleywas second on 60lb 13oz and Bob McBeath third with 48lb 8oz. 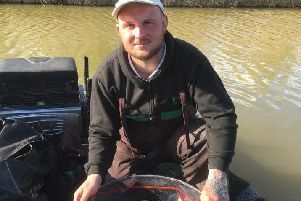 The Saturday Open at Float Fish Farm Fishery was won by Darren Jackson with 73lb 10oz of carp on peg three. Runner-up was Roy Wells (48lb) and third Gordon Harmer (44lb 3oz). Tom Wilson won the Over 55s midweek match with 80lb 6oz followed by Stan Dow (50lb) and Alan Marshall (28lb 2oz).